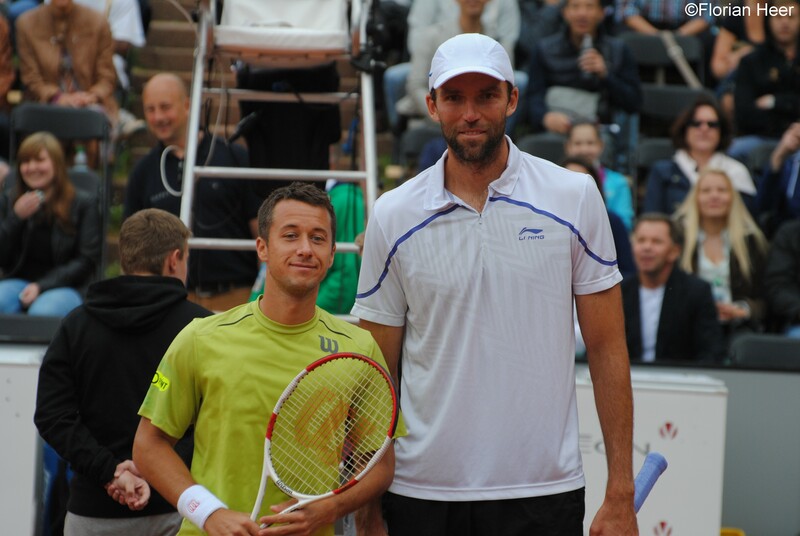 On Saturday’s final at the Düsseldorf Open top-seed Philipp Kohlschreiber and the tournament’s number seven Ivo Karlovic clashed for the fourth time on the ATP World Tour. The German advanced to his first final of the season after gaining back-to-back wins on Friday against Mate Delic and Denis Istomin. 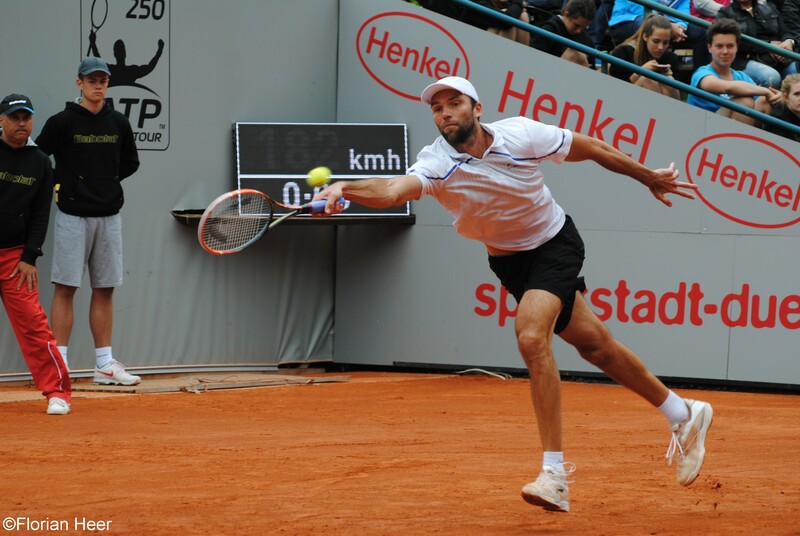 Düsseldorf debutante Karlovic reached his first clay court final in seven years through a straight set victory over Jiri Vesely yesterday. The Croat led the head to head series between the two 2-1. All of the previous meetings took place on hard courts with six of the eight sets the pair has played against each other have been decided in a tie-break. Kohlschreiber looked confident to avoid such kind of a scenario today. The 30-year-old broke Karlovic’s service in the third as well as the fifth game through good returns and a couple of great passing shots. 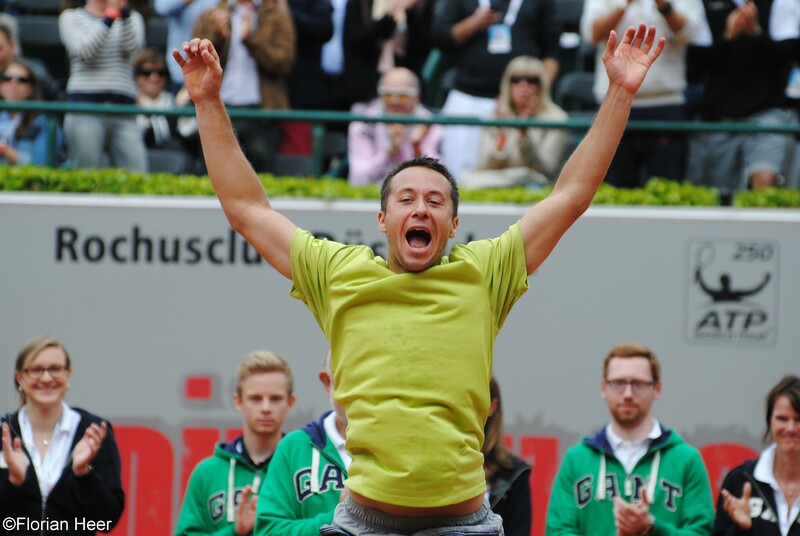 After only 27minutes, Kohlschreiber served the first set out in the eighth game. In the seventh game of the second set, the German converted his third break point out of three but this time the 2,11m giant from Croatia broke immediately back and took the set into an expected tie-break. 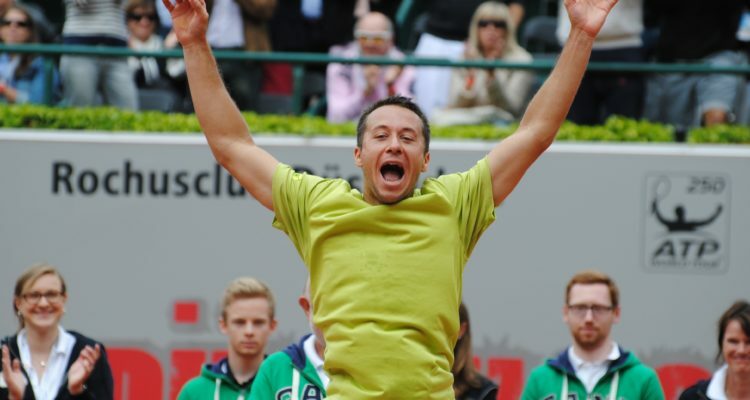 However, Kohlschreiber remained the dominant player on court and finally took the tie-break 7-4 winning 6-2, 7-6 in 72 minutes to gain his fifth ATP World Tour title. “In the first set I returned pretty well and so I was able to neutralize his service. Ivo had to work hard for his points, which he is maybe not used to,” Kohlschreiber analysed afterwards. “Ivo seemed to have some physical problems with his back but I think that this fact did not influence the quality of his services. I was just able to read his service pretty well today. Of course I also had some luck when I speculated for the right side during my return games,” the winner admitted and added that he will go to Paris by car today and drive on his own. “I haven’t had a close look at the Roland Garros draw yet but I think that I’ll be seeded within the top 30, which means that you’ll get a top 8 player in the third round. 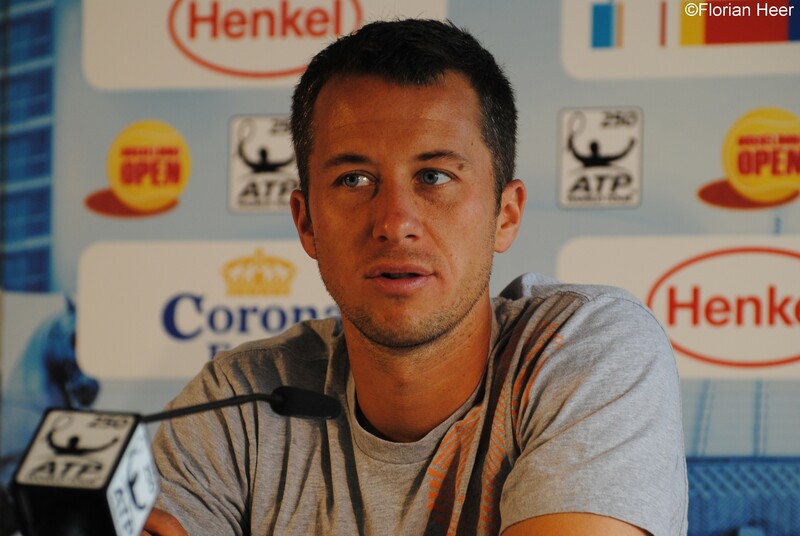 To reach the second week at a Grand Slam is a great success and this will be my goal for this year in Paris as well,” Kohlschreiber told about his ambitions for his first major of the season, as he was forced to withdraw from the Australian Open at the beginning of the year. 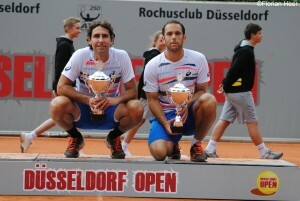 In the doubles final Martin Emmrich, who won last year’s title in Düsseldorf together with Andre Begemann, and Christopher Kas faced the tournament’s third-seeded pair of Santiago Gonzalez and Scott Lipsky. 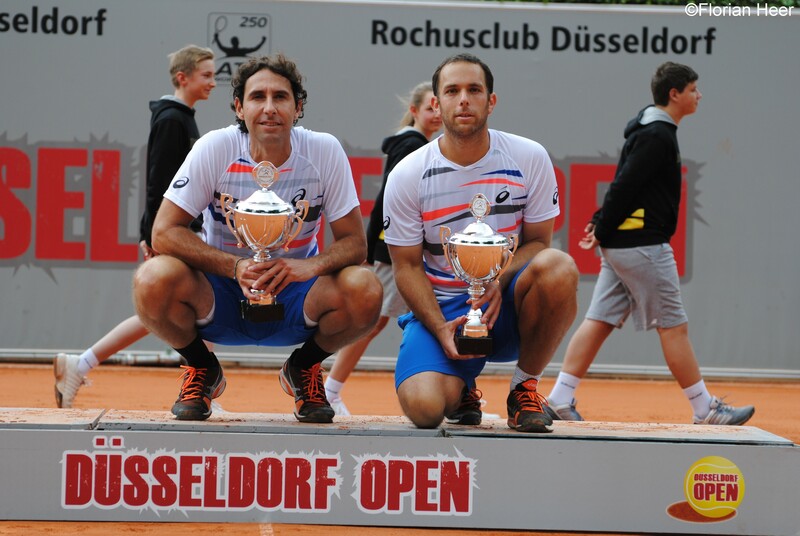 After their victory in Oeiras earlier this year, the US-American-Mexican combination took their second title of the season in Düsseldorf winning 7-5, 4-6, 10-3 after one hour and 34 minutes. It was their seventh victory as a team and so far the tandem has never lost a final. “We had eight great days here with interesting matches in pleasant temperatures. In general we had better weather compared to last year. Players from 32 nations competed in the tournament and we had no injuries as well as no withdrawals, which is a positive aspect. Between 25.000 and 29.000 spectators attended the event, which means that we met our target. Our TV-partner Eurosport as well as the ATP are satisfied with our organisation and gave us a very positive feedback,” tournament director Dietloff von Arnim drew his conclusion from the week in Düsseldorf earlier the day. “Nevertheless, we have to say that we are still looking for a title sponsor to rely on our plans for 2015. 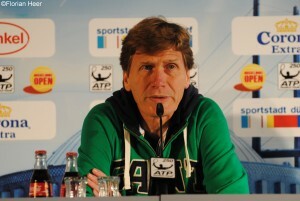 We had first discussions with two interested parties and we are confident to present a partner for the next three years, so that we can also see tennis in Düsseldorf during this period,” von Arnim concluded. 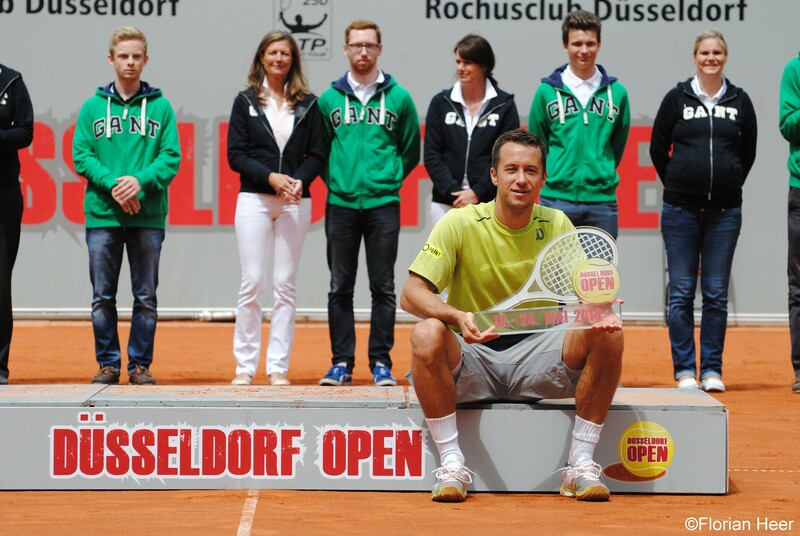 This entry was posted in ATP 250 Düsseldorf, ATP Tour and tagged ATP, Dietloff von Arnim, Düsseldorf, Ivo Karlovic, Philipp Kohlschreiber, Santiago Gonzalez, Scott Lipsky.